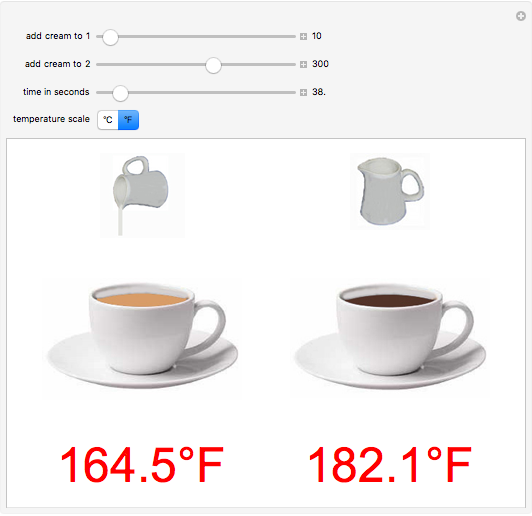 Freshly brewed coffee, immediately after being poured into the cup, has an approximate temperature of 185ºF (85ºC). The coffee becomes safe to drink after it cools to 143ºF (61.7ºC). Suppose you drink your coffee with cream and you want your coffee to be drinkable as soon as possible. Should you add the cream immediately or wait a few minutes? This "coffee cooling problem" has been kicked around for years with varying conclusions. The solution is quite sensitive to specific conditions, but the consensus appears to be that the optimal strategy is to keep the coffee hot (and black) as long as possible. This is a consequence of Newton's law of cooling, whereby the cooling rate is approximately proportional to the difference between the hot coffee temperature and the ambient temperature. The ambient temperature and the temperature of the cream are both taken as 68ºF (20ºC). Conversely, if you want the coffee to keep hot as long as possible—say, you are called away just after pouring the coffee—then the optimal strategy is to add the cream immediately. 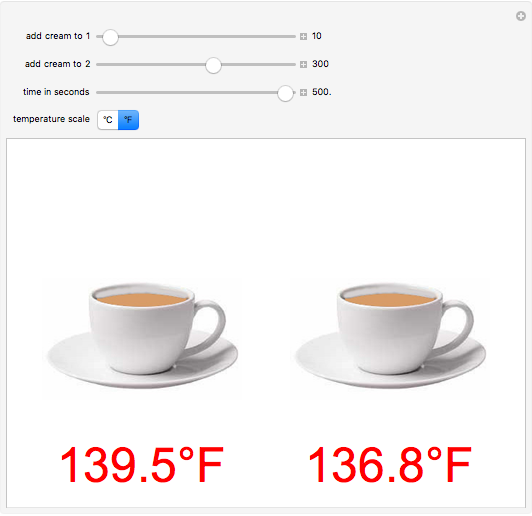 In this Demonstration, you can compare the cooling rates for two cups of coffee when cream is added at different times. The cooling parameters were determined in actual experiments carried out by the author. But, as they say in some commercials, "individual results may vary"! W. G. Rees and C. Viney, "On Cooling Tea and Coffee," American Journal of Physics, 56(5), 1988 pp. 434-437. Snapshot 1: Add cream to cup 1 after 10 seconds. Snapshot 2: Add cream to cup 2 after 300 seconds. It is ready to drink in 365 seconds. Snapshot 3: Compare temperatures after 500 seconds. S. M. Blinder "The Coffee Cooling Problem"